ESA has the ambition to fly from Brussels to Sydney in 2 hours says David Munk who along with fellow researcher Jonathan Jeyaratnam has joined the HEXAFLY-INT project team, a $33M AUD international collaboration focused on flying civil aircraft at hypersonic levels. Their research is being conducted as part of their Engineering Ph.D. theses. David's work involves designing algorithms that assist in novel structural designs for the aircraft that will support the high temperature of hypersonic flight. "One of the main concerns is extreme heat. An aircraft experiences high thermal stresses and a significant reduction in material strength and stiffness when it is taking off or flying at supersonic speeds. "To combat this reduction in strength and rigidity I am designing an optimal algorithm that will determine the best structural layout for such craft. My algorithm will add to the innovative structural concepts being created to handle the harsh environment experienced by the high-speed vehicles," says David. Conversely his colleague Jonathan is concerned with how the aerodynamic design of hypersonic craft will handle the very different low-speed flows experienced at take-off and landing. 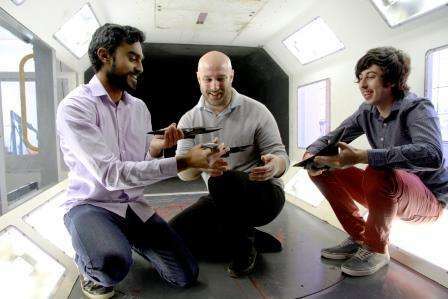 "The aerodynamics of a hypersonic plane is very different to a standard civil aircraft" says Jonathan who will build a low-speed model for testing at the University's Marulan airstrip. "I'm looking at the variation in the sizing, positioning and dihedral (upward) angle of the vertical tail to find out if their positioning can improve the lateral stability but not compromise performance of a craft that travels at Mach 7. I think perhaps an extension of the outboard portion of the wings at the tail may improve the stability of the vehicle at low speed and also improve performance." Hypersonic flight has been the holy grail of aeronautical research for more than six decades says Dr Gareth Vio, who, together with Dr Dries Verstraete, is supervising David's and Jonathan's research and lectures in Aerospace Engineering at the School of Aerospace, Mechanical and Mechatronic Engineering. "David and Jonathan are coming up with radical new concepts for take-off trajectory and tail designs. The ESA was impressed by the Honors theses of both these students and invited them on-board the HEXAFLY-INT team based in Australia. "It is almost forty years since the US defence force flew a plane at speeds faster than a speeding bullet as they say" says Dr Vio. "The record supersonic speed of 2,193 mph was achieved at California's Beale Air Force Base in 1976. But to date commercial application of the technology has been limited by lack of range, stemming from high fuel consumption and low cruise efficiency." If the HEXAFLY-INT project is successful in its endeavours we could be flying to Europe and back in a day," says Dr Vio. Nope. The first hypersonic flight in an aircraft was Pete Knight at Edwards. It is an interesting story, one of the human side of experimental flight test. He did another one later, which took him to over 4500 mph. If you want the story, let me know.